Funny enough, as I get older music seems to becoming more and more important to me. But I don’t think that’s because my tastes are changing; I think it’s because I’m coming to see more and more the power of what music can do in and to us. Music, it seems to me, has the unique capacity to reach us at an emotional level that few things do. And when you combine a beautiful tune with rich, God-honoring lyrics, music becomes not only something to listen to in order to pass the time; it becomes something we can actually look to in order to preach the gospel to ourselves day in and day out. 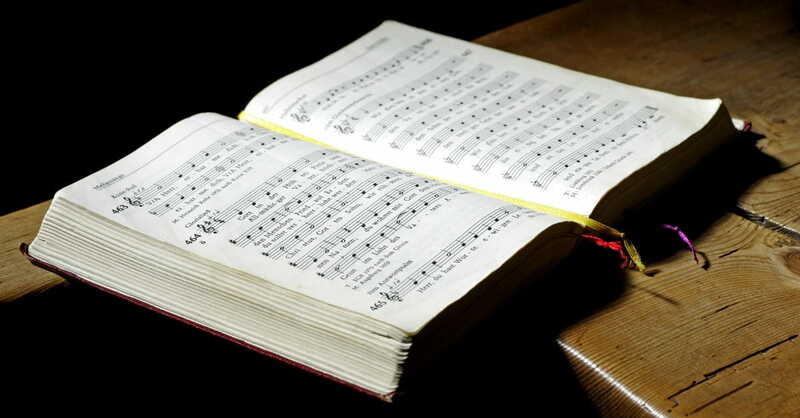 It’s no wonder, then, that scholars tell us that one of the most rich passages in the entire New Testament, Philippians 2, was actually an early Christian hymn. In these verses we find a succinct and memorable recitation of the person and work of Jesus Christ. And it lifts my heart to think that somewhere, in a time long long ago, there were early Christians singing these words. Singing them so they would stick in their memory. Singing them so they would feel them as well as know them. Singing them so that, when all else fails the song would come back to them on the darkest days. Such is the power of song. The story of how this song was composed is well worn. Written by Horation Spafford, in the wake of the devastating loss of his family, the song is a profession of his unwavering confidence in God’s providence even in the worst of circumstances. It as a song, for me, that I wore out when my own son, Joshua, was diagnosed with cancer when he was 2 years old. But as I listened to it and sang it more and more, I realized that when you sing the song in total, it’s a summation of redemptive history. It certainly details the trials and struggles we walk through on the earth, but it also extols the cross of Christ, by which our sin, not in part, but the whole, is nailed to that cross. The song finished with the triumphant return of Jesus to set everything at it’s supposed to be. For my own kids, a song like this helps them remember the grand nature of the story of redemption we are all caught up inside of, and even on the darkest days, that God has not for one second lost control. This is a song about the trustworthy, rock solid, everlasting word of God. And what’s more, it’s a song, starting with the second verse, that is sung from the perspective of God over His people. I love that when we sing this, we are singing God’s promises, reminding our souls and each other what God has said to us and bolstering our confidence in His unwavering promises recorded for us in the Bible. This is also one of the songs we sang together at the funeral of my father-in-law, a man who went to be with Jesus too early in life, but also a man who studied, knew, taught, and loved the Word of God dearly. I don’t know if my kids will remember that particular singing of it, but when the day comes that they doubt whether God’s promises are true, and it will surely come, I’d love for this song to bubble up in their memories. Our kids are good kids. They make good decisions. Not always, but most of the time. And for good kids like these, it’s important for them over and over again to redeclare that their standing on Christ, the solid rock, alone. I hope this song is one of the ways they can fight against the human tendency to revert to trusting in ourselves and our abilities instead of wholly leaning on Jesus’ name. This, I think, is a song of warfare. It’s a battle cry for the Christian that expresses our confidence not in our own strength, but instead in the mighty fortress that is our God. It’s through Him that, even though the enemies and forces of darkness are great, that Christians will reign with Jesus in His kingdom. I suspect that in the future, as our kids grow into adults, they will face increasing opposition to their faith. True enough, that opposition might not look like outright hostility but instead a general sense of apathy, it’s important for them to have a certain “redemptive militance” in their faith. I hope this song is one of the ways they find to express it. This song has always reminded me of Easter – the greatest day. The day that Jesus rose again. We sing it a lot on Easter Sunday, and it rings with joy and truth. This song is the declaration of the rightful kingship and reign of Jesus Christ – it’s a celebration of His coronation as the King of the Universe. Above all else, Jesus is our Savior King. And our great prayer for our kids, more than their safety, comfort, or prosperity, is that they would live in such a way that recognizes the ultimate authority of Jesus in their lives and the world, seeking to spread His fame in all their spheres of influence. I want them to love this song because of what it says. That He is crowned Lord of All. This article originally appeared on michaelkelley.co. Used with permission. Michael Kelley is the Director of Groups Ministry for LifeWay Christian Resources in Nashville, TN. He and his wife Jana have three children. You can follow him on Twitter.